Married collaboration Jen Reilly and Eddy Bluma explore the origins of the oral folk tradition that touches upon outlaw and rock ballads. Their recent Michael Hagler (Wilco/Billy Bragg’s Mermaid Avenue; Jon Langford’s Waco Brothers) produced album, Myths and Mortals, has risen to develop a sound that is world-worn but powerful and commanding of attention. Called "one of the best new albums of 2017" by Steve Morse, 30 year Boston Globe critic, the album expands the duo’s standalone intimate harmonic swells, featuring Chicago hometown heroes Gerald Dowd, John Abbey, as well as Alton Smith. Most outstanding for this rising duo, is the contribution of Austin City Limits Hall Of Fame member Lloyd Maines, whose collaborations range from Guy Clark to Joe Ely. “Old souls,” migrating from desert and sea, the two began collaborating as a folk duo with tempting harmonies and lonesome spirituals. Reilly’s country gospel roots and southern swing deeply welcomed the black leather grit of Bluma’s rock influences in new intertwining medley. Far-reaching, yet familiar; The New Zeitgeist calls from the deep to weary, worn trails of spirits lingering." Myths and Mortals recently got radio play on international Americana stations in France (ISA Radio), The Netherlands, and (aha!) Germany! We were also just featured in Dutch Internet Magazine, The Next Gig, in a beautifully written review by Richard Wagnaar here: http://thenextgig.nl/the-new-zeitgeist-myths-and-mortals/ Take a second and paste it into your online translator; it’s a gift to get a description of music particular to its unique language, and it makes us feel fancy! an exciting piece of news is that after exactly one year since our album release, Myths and Mortals broke into #48 on the NACC DJ Folk charts in July, tying with The Milk Carton Kids! This month, you can now find us streaming on Bandcamp. Ghost Trails and Fairy Tales Tour! this duo shall commence This Month, hither high time for a 21 day, 3 state mobile living experience! The Northeastern Ghost Trail and Fairy Tail tour will take us through NY, MA, and ME (as in Maine, not the personal noun), and a whole lotta travel strategically disguised among seafood ports. We are so excited that the break into NY from Chicago is a mere nine-hour ride to the proud city of Rochester, a prime first stop. We’ll be debuting at the noteworthy Abilene Bar and Lounge on 7/10, and you can listen to our live interview and in-studio performance that morning on WRUR’s Open Tunings with Scott Regan at 11am EST while we discuss how the ancient oral tradition of poetry through folk music continues to linger into our current socio-political times. After spending our first visit in the Catskills, farm-hopping between interviews on a few awesome DJ’s folk radio shows, the final week’s highlight of our trip is in Maine on a potato chip crumb island at a remote Artists' Retreat Cabin. As the Folk nymphs would have it, the host on Sears Island has crowned us venerable campfire jam leaders for an evening under the Aurora Borealis on the rocky coast! A true folk singer’s dream. We are also looking forward to the lobster tent delivery service that I hear happens in Stonington, Maine. Happy ONE YEAR Birthday our 2017 album Myths and Mortals! Physical CD's and Eco T-Shirts are now on sale through our website store and the Ghost Trails and Fairy Tales Tour preparation is underway, including our new promo photos on the site. Take a look around! The New Zeitgeist Continues Popular Live-Music Series! Thanks to The Highland Park Landmark Newspaper for including their review of our duo's performance featured in this year's Highland Park Public Library Note-to-Note Series. Click here for the Article! Our Interview by Chicago N' Beyond has just been featured in roots Journal No Depression! You can read all the nitty gritty here! Thanks to public and community radio, we made December's #195 in the Top 200 Folk radio charts! Also, our album Myths and Mortals got a mention from Goldmine Magazine: The Collectors Record And Compact Disc Marketplace (Click here). Here's a snippet:"Hmm. It’s been a good year for Americana and roots music. Let’s look back on some worthy discs – some by big stars, some by barely known people. Thanks to Music Critic Tom Wilk for closing out our year with a dazzle! To our surprise and delight, our album made the last month of the year's music column in Icon Magazine! You can read the full review (click here), in which we are the only self-released album! In reflection of October, some exciting news from The New Zeitgeist is that Myths and Mortals ranked #5 in the top airplay playlist at WERU-FM Community Radio 89.9 in Blue Hill, Maine! A Northeast tour is in the works for the summer of 2018. Click on the link above to hear our live interview with WGN host Justin Kaufmann. We talk about the genre of roots, contemplate the meaning and power of folk, how stories shaped the record, & working with the great Lloyd Maines on our latest record, "Myths and Mortals." Watch our liveStudio 435 performances of "Looking Glass Man," "The Ghost Trail," and "Desert Rose." Jen Reilly and Eddy Bluma, the Chicago based duo that dubs themselves The New Zeitgeist, met as solo artists in 2009. Eight years later, they have created a particular branding that relies on heady perception, a knowing perspective and a haunting goth/folk/country sound. In a sense, "Myths and Mortals" portends to be something significant, whether it's through the pair's obvious reverence for traditional roots or a general sort of circumspect that suggests they're aiming for a philosophically higher ground. In fact, it's a level of awareness that only book literate, fully cognisant listeners might find cause to fully appreciate. 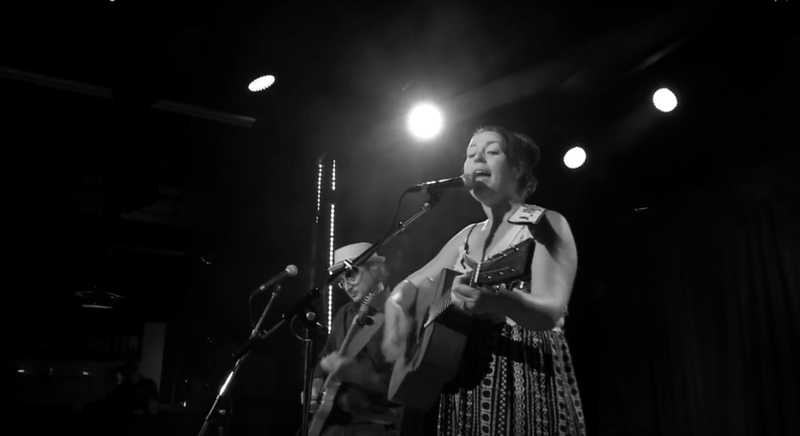 Like the Handsome Family and forlorn folksters of an earlier era, Reilly and Bluma harbor the spirits that dwell in the hidden hollows of Appalachia and the dust blown stretches of far western prairies. There's a mournful sadness that seeps through these songs like the wind through a creaky screen door, all barren emotion and weary resignation. Reilly wails and moans in ways that elevate these plaintive melodies to a higher purpose, giving songs such as "The Ghost Trail" and "Old Hammerin' Bill" a vivid tone and trapping that's as darkly descriptive as the names imply. Reilly and Bluma are old souls in every sense - stoic, solid and sincere,bound to a tireless tradition that serves both the imagery and their intentions very well. Ultimately, "Myths and Mortals" may prove to be too deliberative and pensive for some, too dire and despondent for others. None of that should be surprising, given the fact that the pair have carved out a vintage-sounding niche. Still, those that admire a certain seminal style may will be entranced, drawn to the cerebral suggestion that this rugged gem of a record has to offer. Good luck guessing which three of the 11 tracks here date from the 1800s; they sound no more or less timeless than the originals on this album, which features vocals and poetic lyrics by a Chicago-based duo: Jen Reilly, who sounds redolent of Judy Collins, and Eddy Bluma. If you like the work of such artists as Fairport Convention, Renaissance,and Richard and Linda Thompson, give this well-honed collection a listen. We had a gas at the WLUW studio discussing blue hair, ghost trails, and why fairies are on the new album. Click on the player to listen to the full interview! Middle America visits the citizens of middle earth as Chicago, Illinois duo The New Zeitgeist explore the origin of Folk traditions and oral stories involving meetings of Myths and Mortals on their recent release. The New Zeitgeist link the past with the present, spinning tales in tune with olden times (“Lake Isle of Innisfree”, “Peter Pan’s Remorse”) with an nod to the Myths and Mortals that inhabit the new lands of America (“Song of the Chattahoochee”, “Old Hammerin’ Bill”). The folk-based feel of the album incorporates elements of western Country as twang moves slowly on the dry air breeze of “Desert Rose” and mountain rhythms push the pace along the dark edge of “The Ghost Trail”. 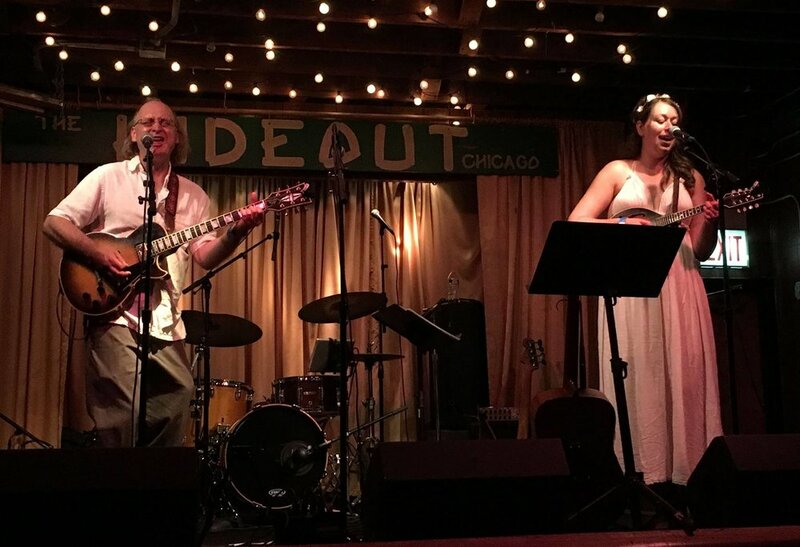 The New Zeitgeist came together when solo performers Jen Reilly and Eddy Bluma met on the Chicago Folk music scene. Performing as a duo since 2009, the pair blended Southern feel of Jen Reilly’s background with the grit in the music of Eddy Bluma. Myths and Mortals wanders “Kingdom Highway” with majestic vocals, lightly steps on sparkling notes for “Fear of Little Men (March of the Faeries)”, and puts downfalls heavy footfalls of rhythm for “Looking Glass Man” as The New Zeitgeist back the fantasy tale in “The Wandering Aengus” with soft country guitar riffs. "Songs evoking a sense of mystery are often missing from today's music scene, but they are the lifeblood of this hauntingly brilliant Chicago act. Anchored by singers Jen Reilly and Eddy Bluma, the group delves into everything from mystical folk tales to adapting timeless poems by Carl Sandburg and William Butler Yeats. The enchanting, electro-acoustic soundscapes move from Celtic folk-rock to soulful country in the vein of Emmylou Harris and Gram Parsons (the song "Desert Rose" evokes Parsons' legendary "Hickory Wind"), to the more determined rock of Bluma's "The Ghost Trail." Reilly has a supple, emotionally riveting voice that suggests the legendary Sandy Denny of Fairport Convention. She mesmerizes throughout, whether on her self-written "Kingdom Highway" or the public domain "Song of the Wandering Aengus," where her vocal takes a flight into the heavens and leaves you completely in awe. Hands down, this is one of the best new albums of 2017." You can purchase the album in either form of a digital download folder or CD directly from the band at our website store www.thenewzeitgeist.com/store! We also have digital distribution across most online music platforms including iTunes/Apple Music, Spotify, Google Play, and Amazon (physical warehouse & digital) if you prefer a certain online store, made possible by our distributor CD Baby where you can find special deals on buying the album in bulk (makes a great gift J). Additionally, our YouTube channel has experienced a complete new summer “do” and is ready for watching! Our band name evolved from considering time...the times, critical points in time, and new eras. We not only hope to revive ageless stories that are especially meaningful today, but cultivate a spirit of connection. In a growing time of divide, disparity, and doubt, our music, sound, and stories are evolving and our latest recording effort has nearly come to completion! Friends, we are proud to make the announcement of our 2nd upcoming album, Myths and Mortals, to be released early Spring 2017! It highlights poetry and folktales from nature and beyond while digging even deeper into the edgier roots of rock, folk, and blues. It features hometown heroes Gerald Dowd on drums and John Abbey on bass. Also featured on steel will be Austin City Limits Hall Of Fame member Lloyd Maines! We are moved to have met you somehow along the way—because we believe art comes from a true encounter with another that leaves you changed. We are ecstatic and humbled to invite you to support our band by connecting with our band page on Facebook, as well as our new website where you can keep updated on our events, upcoming shows, and single release. Look for our new single, "Song of the Chattahoochee" end of January that will be available on our new website! Our hope is to not only join some small part of renowned literary winds to which we owe everything, but join a new spirit of artists in creating the times ahead. We hope you and yours are renewed, inspired, and whole this coming year of 2017!!! Thanks for your amazing life as artists.